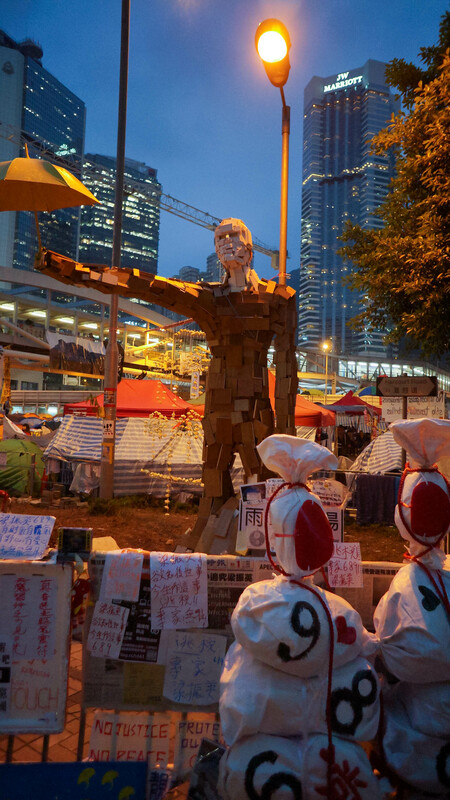 A few years ago, the Filipino author F. Sionil José told me that “Bad times produce good art.” I recently saw the truth in his words in the outpouring of creativity the Occupy movement has inspired in Hong Kong. Protesters have chosen to live on the streets in the hope of true democracy and the chance to elect their own leader, leaving behind comfortable beds in favor of hard tarmac. Yet in spite of the discomfort and the coming winter, they remain positive. One of the greatest sources of strength for them has been the outpouring of spiritual and emotional support they receive from the ever-changing art gallery in which they came to live. 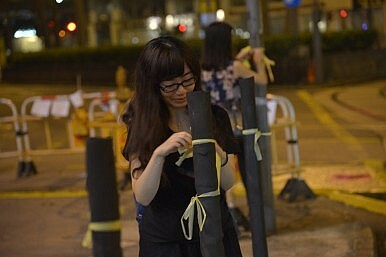 Usually sterile and functional thoroughfares have been covered in chalk drawings; flyers, posters, and stickers are plastered over all available surfaces at protest sites; barricades built of metal barriers, crates, dustbins, and the occasional bus stop sign have been adorned with open umbrellas. Street art provides everyone the opportunity to air their take on the ongoing political situation: some are comic, others heartfelt. But one thing they all share is their artists’ anonymity. Since catching every artist is an impossible task, anonymity has given many the courage and confidence to take to the streets and engage in political art – with hundreds of these works put up within the protest zones every day. These anonymous artists have a keen sense of respect for each other, as no one ever removes another’s work in order to replace it with their own. How long a piece of artwork stays on display is at the mercy of external forces, such as the weather and the ever-present threat of removal by authorities. Once it is destroyed or removed, however, it opens up a space for yet another artist to exhibit his or her work. The constant additions and reworking of the art on display, coupled with the availability of open space in these often crowded districts, attracts visitors to return, to see or hear the latest commentaries regarding the Occupy movement, usually served with a generous helping of wit and humor. Of all the works on display, the most popular and longest-lasting are the striking Lennon Wall and the giant Umbrella Man sculpture at Admiralty. These have been up since the beginning of the movement, featuring a multi-colored mosaic of handwritten notes of encouragements on Post-Its on a sheltered staircase wall and a sculpture of a man holding an umbrella built using wooden blocks respectively. Volunteers are working to save these and others from impending ruin, reaching out to museums to assist in documenting the art on display at protest sites, but have been refused by some, supposedly because of their illegal assembly origins. Others have informed protesters that they should submit works for consideration through the usual channels, disregarding the time-sensitive requests for preservation. Although museums are state institutions, it is obvious to the world that the Occupy movement is a historical first for Hong Kong, and while the artistic value of the works may be debatable, their significance is clear. What the museums have failed to do, the people of Hong Kong have stepped in. In addition to the volunteers that have mobilized to document the Lennon Wall for online viewing in the event of the wall’s removal, hundreds of hobby photographers have taken to the streets as well. No one walks through any of the protest zones without pausing for a photo at least once. After all, the sight of a makeshift shrine to the Chinese God of War Guan Gong built of crates, complete with an offering table and sticks of incense on one end of a popular shopping street and a tent set up with crosses and portraits of Jesus on the other end is unusual to say the least, especially when both religious figures are bearing yellow umbrellas. Meanwhile, I have heard that an antiques dealer in Hong Kong has commissioned three replicas of the upper torso of the Umbrella Man – one of which is to be gifted to the United Nations. Interestingly enough, many of these art pieces are not permanent; most are sheets of paper or stickers stuck on all available surfaces or banners, while the bigger pieces of installation art can be dismantled the same way they were erected. There are few instances of spray-painted graffiti featuring material related to the Occupy protest, although admittedly some road dividers on Nathan Road have been vandalized with random slogans, which people have attempted to scrub away. It seems that the protesters’ sense of responsibility stretches to their artistic expression, as by keeping their protest art easily removable, they avoid any permanent defacement of public property. To borrow the words of an advertising executive: “The protest has been the best thing to have happened to the HK brand.” The events of Occupy Central have brought out the community spirit in a city that is largely famous for its pragmatism. I have seen onlookers moving to serve as a shield for scaffolders building a shelter for protesters when the police were advancing, the smiles on the scaffolders faces as the crowd treated their (usually unnoticed) skills as a performance art show, taking photos and videos as they watched the scaffolders at work, and their shy acceptance of the cheers and applause upon completion of the structure. 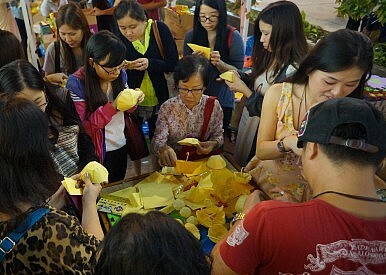 I have also seen onlookers and protesters alike learning to fold origami umbrellas (yellow paper provided) from a stand at Nathan Road, and I have heard countless spontaneous renditions of Beyond’s famous “Boundless Seas and Skies,” whose lyrics about freedom and courage in the face of adversity has touched the hearts of a nation. 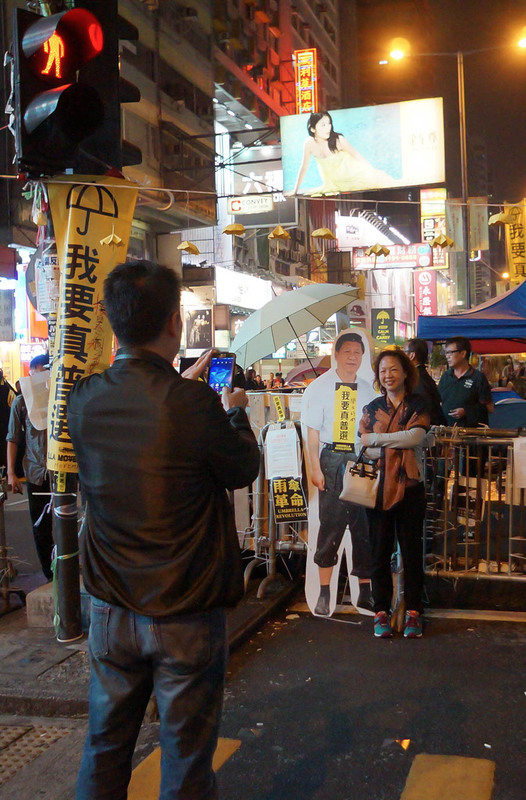 Chunwan, Art and AuthoritarianismHong Kong’s Umbrella Movement, One Year LaterHong Kong: Taiwan’s Broken MirrorWhat Hong Kong Occupy Could AchieveIs 2014 the Start of an Asian Spring?